This elegant, French-inspired Spring Green, Leek and Gruyere Tart is perfect for lunch, brunch, light supper or whenever you need your meal bases covered. 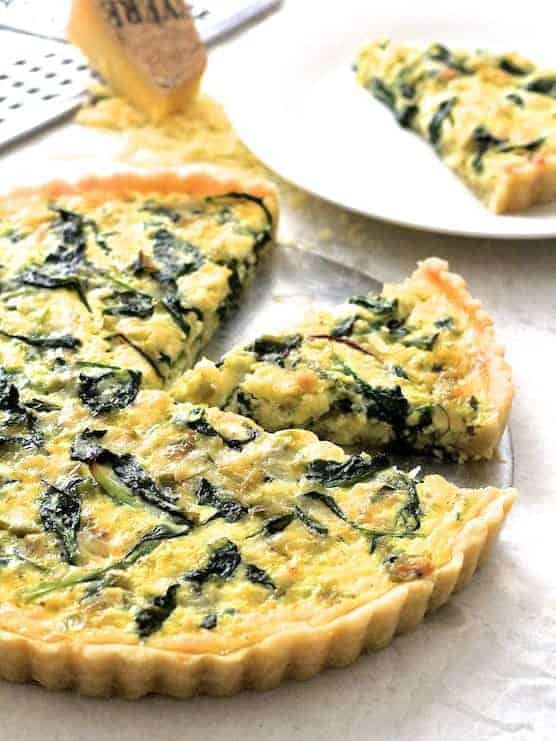 A tart or quiche is perfect for breakfast, brunch, lunch or light supper and can be filled with almost anything on hand, making it a flexible option when you need to have your meal bases covered. There are minor differences between quiches and tarts. Quiches are always savory, while tarts can be sweet or savory. Quiches are baked in deep pans, while tarts are baked in shallow pans that typically have removable bottoms. Both have only a bottom crust. This savory Spring Green, Leek and Gruyere Tart features baby greens that are best in spring but available year-round, and leeks, which start in spring and go into fall. Any sturdy baby green such as mustard, spinach, arugula, kale or chard will work in this dish. Produce departments have prewashed baby green combinations in clamshell containers. However, don’t confuse baby greens with baby lettuces or spring mix; they won’t work in this dish. Leeks can contain dirt hidden between their layers. After slicing, place in a bowl of water. Gently move them around so dirt can fall to the bottom. Let them settle a bit, then carefully remove with a slotted spoon or sieve. Whether you make your crust from scratch or use a purchased refrigerated crust, it will require blind baking before filling. 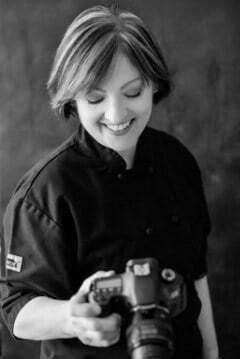 Start with a chilled crust, place a piece of parchment paper over the dough, then fill with pie weights, dried beans, rice or lentils. Pie weights come at a cost, so I like to recycle dried beans, rice or lentils that have gone beyond their “use by” date. You don’t however, want to reuse them in a bean, rice or lentil dish as they won’t cook properly. Gruyere cheese has a lovely, nutty flavor, but it can be pricey. Feel free to use a cheese that fits your budget. Swiss and white cheddar are good alternatives. 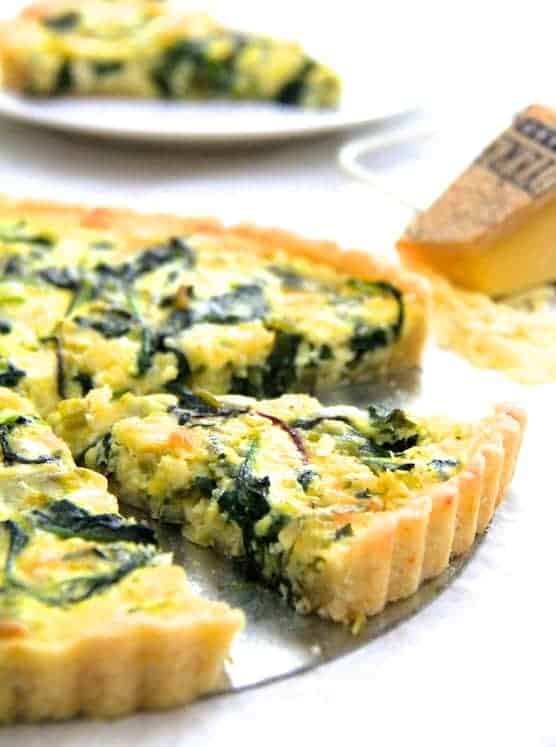 This elegant Spring Green, Leek and Gruyere Tart is perfect for brunch, lunch or light supper. Preheat oven to 400 degrees. Combine butter, flour, sugar and salt in a food processor. Process until mixture is crumbly. With the food processor running, add ice water by the tablespoon until the dough just holds together. Spray a 9-inch tart pan (with removable bottom) with cooking spray. Press the dough evenly into the tart pan and up the sides. Prick the bottom of the dough with a fork. Place in the freezer for 20 minutes. Place a piece of parchment paper over the crust and fill with pie weights, beans or rice. Bake for 15 minutes or until the crust is set and light gold in color. Let cool. Reduce oven heat to 350 degrees. Heat butter and oil in a small saute pan. Add the leeks and cook 8 to 10 minutes or until very soft. Add small amounts of water as needed to prevent the leeks from drying out and burning. Add the greens and garlic and cook 2 to 3 minutes or until greens are wilted. Let cool. Stir in Gruyere cheese. In a small bowl, beat eggs until blended. Whisk in half-and-half, salt and black pepper. Spread leek, greens and cheese mixture evenly over the crust. Pour in egg mixture. Bake for 40 to 50 minutes or until center of tart is firm to the touch. Let cool slightly, then cut into pieces and serve.